This is a Friday afternoon art class designed for kids who love art and would enjoy a fun art experience to end their week! Art Adventurers will experience hands-on, open-ended, age appropriate art adventures and activities. They'll work with media like watercolor, temperas, acrylic paints, pastels, collage, mixed media, assemblage, and more. This class is open to young artists entering 3rd thru 7th grade (ages 8 through 14). Session registration is encouraged to ensure a space and SAVE $10! Registration is also available at the BAC Studio. Please register EARLY to ensure a space. A Friday after-school art class for young artists ages 6-14. Expect to create spring and Easter-themed art this session! A fun Friday after-school art class for young artists ages 6-14. This session we'll work on Spring-themed art projects and something special for Mom. 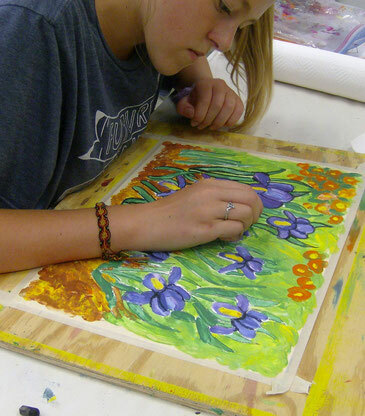 A Friday after-school art class for young artists ages 8-14. We will focus on seasonal subjects and a variety of art media this Session.